Bevoman Triathlon is the 2018-2019 USAT South Midwest Collegiate Conference Championship race, hosted by and benefiting Texas Triathlon at the University of Texas at Austin. 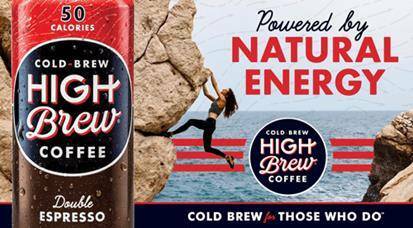 This fifth annual event will take place on March 3, 2019 and will serve as a great tune-up race for collegiate athletes heading to USAT Collegiate Club Nationals. 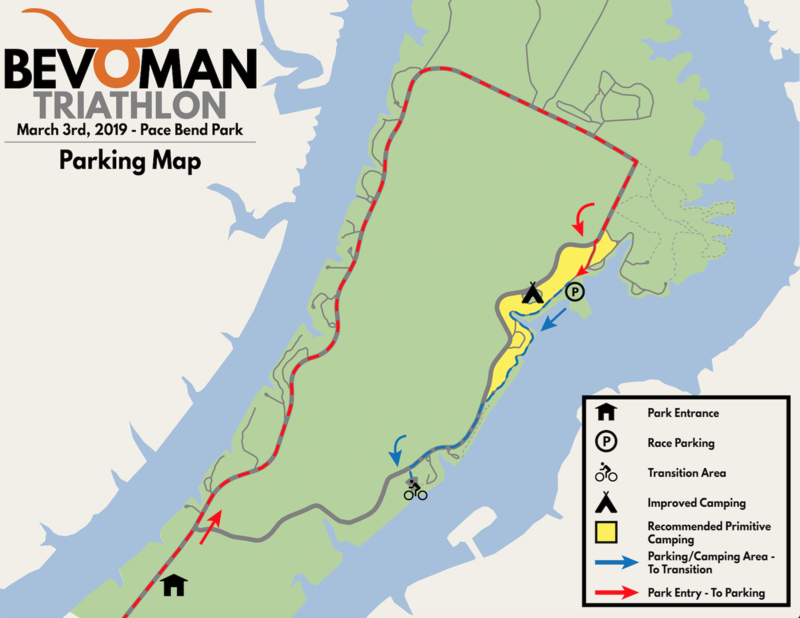 Bevoman will feature an open division, allowing anyone to race alongside some of the fastest collegiate triathletes in the nation at Pace Bend Park in beautiful Texas Hill Country. When: Sunday, March 3, 2019. Race will start at 8am. Registration: Race entry is $105 for the open division and $80 for collegiate. Registration includes entry into the Olympic distance race, race morning park entry, an event t-shirt, and delicious post-race food. Register Here. Relay: Participants may form a relay team of 2 or 3 athletes of any category/gender. The timing chip will be passed from athlete to athlete in the transition area. Team captain should register for the entire team (put additional team members in the “Team Name” box at registration). Cost is $130 to cover additional park entries, shirts, and food. Additionally, since Bevoman is a USAT sanctioned race, non-USAT members will be required to purchase a $15 one day membership. Registration closes February 28th so get in while you still can! We need 80 volunteers to make this event possible. If you or someone you know is interested in volunteering, please fill out the Volunteer Form. All volunteers will receive free park admission/parking, an event T-Shirt, post-race food, and a front row seat to watch some of the fastest collegiate triathletes in the country! Bevoman Triathlon is a USA Triathlon sanctioned event, and will be following and enforcing the USA Triathlon Competitive Rules. Wetsuits are strongly recommended for your safety. Austin Tri Cyclist will be offering wetsuit rentals for the weekend! Check out the current water temperature leading up to the race for an idea of what to expect. The Bevoman Olympic distance race will be NON-draft legal. Officials will be on the course enforcing drafting and position rules. Helmets and handlebar plugs are required. Triathlon and time trial bikes are allowed given they meet the specifications in the USA Triathlon rules. The collegiate division will be scored according to USAT’s collegiate scoring guidelines for conference championship races. Conference commissioner Tim McCurry will be presenting the collegiate awards. The open wave will be scored by gender in age groups of 5 years and have award for top 3 in each category. For example: Men 20-24, Women 20-24, Men 25-29, Women 25-29, etc. The max age group will be 50+. Additionally, there will be awards for fastest swim, bike, and run splits per gender in the Olympic distance race. All athletes must present a valid Photo ID and proof of USAT membership to pick up their packet. 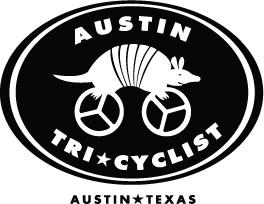 March 1st and 2nd, packet pickup will be hosted by Austin Tri Cyclist, located on 923 Barton Springs Rd, Austin, TX. Transition Area: Transition area will serve as race headquarters. Bike racks are located to the east side of the Tatum Cove parking lot. Restrooms will be on opposite (west) side of the parking lot. Team tents, packet pickup, and sponsor tents will be set up in the middle of the parking lot. Post race food and awards will be located between finish and run out. Course Description: Olympic Distance Triathlon – 1500m swim, 40km bike, 10km run. Swim: Athletes will start in waves. The collegiate men’s wave will start at 8am and subsequent waves will start in 5 minute increments. Each wave will start in the water, behind the first buoy. Athletes should swim along the outside of the buoys, keeping the buoys on the right at all times. Sighting buoys will be yellow, turn buoys will be orange. T1: Athletes will run up the boat ramp upon exiting the water, turning right at the top of the hill into the southwest corner of transition. When exiting transition in the northeast corner, stay in the left lane and mount at the mount line shortly after transition. Follow the cones up the hill, and finally turn left while watching out for racers and other traffic merging into the main road. Bike: The bike course consists of 4 laps of rolling hills with over 1000ft of elevation gain. All bike traffic should stay to the right, inside lane of the road. Although park traffic will be minimal, the outer road lane will remain open to traffic during the race. Note that between about 9.5km to 10km on each lap, the bike course will narrow down to around 6ft to accommodate bikes, traffic, and runners on the same road. Please be extra cautious here and avoid passing if possible. T2: Upon finishing the 4th lap around the course, athletes will make a left turn back into transition. Be aware of other athletes and traffic. The dismount line is the same as the mount line, at the bottom of the hill next to transition. Be sure to slow down to safely make the turn at the bottom of the hill. Enter transition from the northeast corner and start the run through the same southwest corner that was used for T1. Run: The run is an out-and-back course consisting of pavement and off-road trail terrain. Athletes should stay to the right of the course, to allow room for 2 way traffic. Aid stations will be located approximately every 3km. The finish line is located just before the grass field next to transition. Please follow these guidelines to ensure a safe and efficient park entry. Saturday Arrival: While you can camp anywhere in the park, we recommend camping near the improved campsites for $15 per vehicle (cash/check only). This is where a majority of collegiate teams will be camping, and closest to all the action. Camping is NOT allowed near transition area as this area will be closed and cleared in advance of the race. Sunday (Race Morning) Arrival: Please arrive early to allow ample time for parking and transportation to the transition area. You will be greeted by a volunteer at the park entrance that will validate free entry for athletes and volunteers. Spectator entry cost is $10/car, but you can save by carpooling with a participant. Upon entering, drive straight for 4 miles (red line on above map) until a parking volunteer directs you to turn for parking. Please drive slowly and watch out for athletes along the road. You can park anywhere in the grass field at Tournament Point. Parking is not allowed near the transition area. 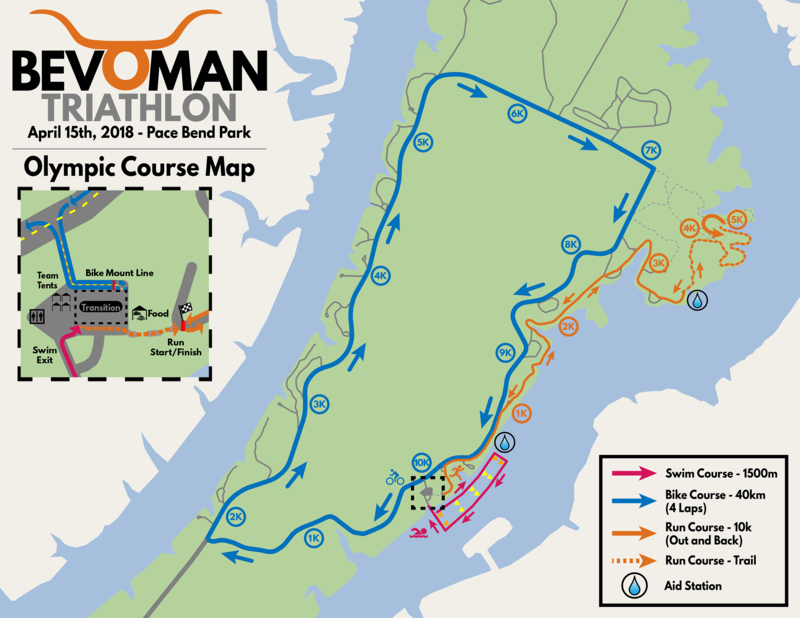 Athletes should gather everything they will need for the race and walk or bike approximately 1 mile (blue line on the below map) to the transition area. There will additionally be a limited number of shuttles running between parking and transition. Camping at Pace Bend Park is preferred. Nothing beats being able to wake up and walk to the race course! For $15 per vehicle (cash/check only), you can get a primitive camping pass, which allows you to set up camp in any open area of the park. Pace Bend Park also has a limited number of improved camping passes for $20 per vehicle (cash/check only), which have access to sites with running water, electricity, and showers. All improved sites are reserved for collegiate teams racing at Bevoman, and assignments will be sent out a few days before the race. Please email us to reserve them. If you are not assigned improved campsites, don’t worry! There will be plenty of primitive camping spots available. Remember that you will need to bring your own tent, camping supplies, water, and food. For information, visit the Pace Bend Park Website. Inside the park, the Highland Lakes Camp and Conference Center baptist camp off offers group motel lodging. You can submit a reservation request on their website, but we cannot guarantee availability. Alternatively, a quick internet search will pull up other nearby hotels. For those who are not staying in the park, we have arranged to pay park entry fees for all athletes and volunteers on Sunday morning arriving before 8am. On arrival, notify the volunteer at the park entrance that you are with Bevoman and they will give you an entry voucher! With the help of our supporters we will bring you the best race day experience possible. If you are interested in becoming a supporter please send us an email at Bevoman@texastriathlon.org.